This panel, which is signed and dated on the blade of the knife, is an excellent example of the still lifes painted by Willem Claesz. in the 1630s. 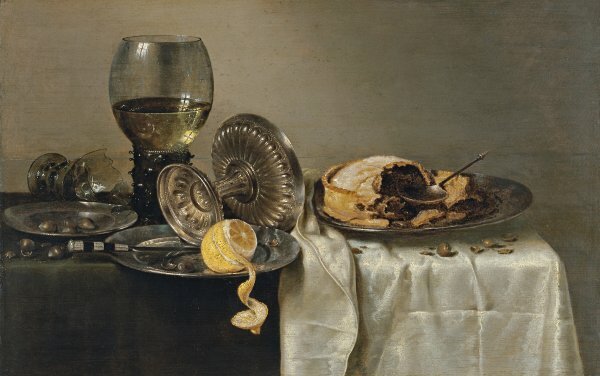 Along with Pieter Claesz., Heda was one of the artist who introduced innovations into still-life painting and developed new themes. Heda and Claesz. also experimented with the new tonal trend that had arisen in Dutch art, particularly in landscape, of which the leading exponents included Jan van Goyen, Salomon Ruysdael and Pieter de Molijn. Among the themes that these artists made popular were the so-called “breakfast pieces”, compositions in which the various elements were selected to present meals of a notably frugal type. The present panel appeared on the German art market in 1956 and was acquired by the Cramer gallery in The Hague. While it was in Holland it was included in a supplement of The Burlington Magazine in 1956 as one of the most important works on the art market at that time. The panel was acquired for the Collection from the Cramer gallery in 1958. The arrangement of the objects in the painting is typical of Claesz.’s style, with a greenish background that does not distract the viewer’s attention and which receives the light from slightly off-centre to the left. On the tabletop, which is covered with a dark cloth, the white folds of the ample cloth create a bold contrast. Rather than being depicted fully open, the cloth is half folded back among the items on the table in a manner that would become habitual in this artist’s works from the 1640s. There are few elements on the tabletop, but Claesz. devoted great care to the depiction of the materials and textures, while the interplay of colours and reflections on their surface is particularly emphasised. Thus the pewter plates with their dark, cool tones are contrasted with the silver cup lying on its side. The two glasses, one broken and the other upright, receive the light from windows located in the spectator’s space, as the reflections on them reveal, a detail evident in other paintings by this artist. This well-balanced still life is organised through diagonals that create the space, reinforced with effective and striking devices such as the location of a plate on the edge of the table with the peel of a half-peeled lemon hanging over the edge. The perspective is also emphasised by the position of the overturned silver goblet in the middle of the table. The colours within the limited chromatic range are harmonious, creating a subtle world of contrasts with no discordant notes. Heda’s still lifes are not depicted as ready to eat but rather indicate human actions that have already taken place. The objects are thus disarranged, the pie partly eaten, the lemon half-peeled and the shells of the hazelnuts scattered across the table. The British Royal Collection has a similar composition that has been considered a replica or version of this one.